A victim of fraud will typically seek compensation through civil proceedings. Proceedings can be brought against the fraudster or the person who committed the breach. In addition, the victim may have claims against any persons who were 'knowingly involved' in the fraud or breach, or against the recipient of the misappropriated property. Where the misappropriated property can be sufficiently identified and the victim can establish a proprietary interest in that property, that proprietary interest will rank ahead of competing claims by any other creditors. Accordingly, an insolvency of the fraudster will not necessarily preclude the victim from recovering the loss. A broad range of orders are available from the Australian courts to assist the victim. These range from orders for compensation and the return of property to orders freezing the assets or permitting the victim to search premises where evidence may be held. The causes of action and remedies that might be available to a victim arise under statute, at common law and in equity. They include both personal and proprietary claims, the latter of which will involve tracing. 'Tracing' is not of itself a claim under Australian law. Australian courts have approved the statement by the House of Lords in Foskett v. McKeown5 that tracing is neither a claim nor a remedy; rather, it is a process by which a claimant demonstrates what has happened to the claimant's property, identifies its proceeds and justifies a claim to those proceeds as being the claimant's property. In matters such as the misappropriation of company funds and fraudulent misrepresentation in company sales or equity raisings, criminal proceedings are sometimes brought by the regulator, the Australian Securities and Investments Commission (ASIC) rather than by the police. ASIC has powers to bring criminal proceedings under legislation, including the Corporations Act 2001 (Cth) (Corporations Act) and the Australian Securities and Investments Commission Act 2001 (Cth). While ASIC may seek compensation orders as a result of the conduct in question, its focus is often on seeking criminal sanctions (including imprisonment) or seeking civil penalty or banning orders. Where property is misappropriated, the victim's primary recourse will often be a civil claim against the person who committed the fraud or breach of duty. As stated above, where the relevant conduct infringes legislation administered by ASIC, ASIC can also bring civil claims. The basis for the claim against the primary wrongdoer is likely to be straightforward. However, as a practical matter, civil claims are often of limited value in terms of recovering the property or obtaining damages, as assets are regularly dissipated or removed from the jurisdiction, and the wrongdoer may either disappear or file for bankruptcy. A better source of potential recovery for the victim may be a claim against a third party who participated in, was knowingly involved in, or assisted the person who committed the fraud or breach of duty. That type of 'knowing involvement' claim is illustrated by Australia's longest-running piece of litigation, which is proceedings brought against a syndicate of banks arising out of the collapse of the Bell group. Those proceedings concerned, in summary, claims that the directors of the Bell group companies breached their duties to those companies, and that the banks had the requisite knowledge of the breaches to be held liable as constructive trustees. Judgment was entered against the banks for A$1.75 billion.12 Set out below are potential causes of action against 'accessories' to the breach or to the fraud. Other claims that may be available against accessories include claims for the tort of conspiracy and the tort of negligence. Identifying the right parties to sue: if the misrepresentation was contained in a disclosure document, damages may be available from, inter alia, the directors of the body making the offer21 (although there are defences that may be available to the directors, such as the due diligence defence). In equity, the two main heads of accessorial liability are the two limbs of Barnes v. Addy, which are knowing assistance in the breach of trust or fiduciary duty, and knowing receipt of trust property. Knowing receipt is discussed further below. A knowing assistance claim under Australian law has four elements:22 the existence of a fiduciary duty (as trustee or otherwise); a 'dishonest and fraudulent' breach of that duty in the sense of being morally reprehensible;23 knowledge of the dishonest and fraudulent breach on the part of the third party;24 and assistance in that breach by the third party. To establish knowing assistance, the actions of the third-party assistant must have had 'some causal significance' – that is, that 'the plaintiffs must prove that the defendants' conduct made a difference, in the sense that it advanced the primary breach in some way',25 although English law suggests it is not necessary to establish a precise causal link between the assistance and the loss.26 The equitable remedies that are available if the claim is established are discussed below. Where proceeds of fraud or a breach of duty have been transferred to a third party, the victim may be able to recover that property from the third party or be compensated for the loss under a range of civil remedies. Establishing a proprietary interest in the misappropriated property will enable the victim to rank ahead of all other creditors in respect of that property. The main remedies at common law against a third-party recipient of property are actions for money had and received, and for conversion and detinue. A detailed discussion of those remedies is beyond the scope of this chapter. However, it should be noted that the common law remedies have some notable limitations. They rely on the plaintiff establishing a legal title to property that needs vindicating, which requires being able to trace title to the property at common law. There are some common forms of mixing that will result in legal title to the property no longer being traceable. For example, if a director misappropriates company funds, pays those funds to a relative and the relative mixes the funds with his or her own funds, that will end the company's common law chain of title. Equitable remedies are broader and more flexible than common law remedies. They include declarations of ownership and constructive trust, declarations of charge, an account of profits and equitable compensation. Equity will recognise proprietary claims, via a constructive trust or charge, in more situations than the common law because equity will trace into mixed funds as well as into any property that is substituted for the original asset, including any proceeds of sale of the property.29 Tracing is not restricted to cases involving breach of fiduciary duty (e.g., misappropriation by a director of company funds). In Black v. S Freedman & Company, the High Court recognised a right to trace funds against a thief on the basis that stolen money is held on constructive trust by the thief. The company that was the true owner was able to trace the moneys that were paid over to the thief's wife.30 It was not suggested that the thief's fiduciary relationship with the company was a necessary element to the tracing claim. Property transferred away: the proprietary remedies consequent on tracing do not impose any personal liability. Once the property leaves the recipient's hands, the remedies are no longer available against that recipient. If a plaintiff establishes a proprietary entitlement to certain assets via tracing, the court has no discretion to deny a remedy,40 although it may have a discretion as to which remedy is applied. knowledge of circumstances that would indicate the facts to an honest and reasonable person. The limitation period in Australia for statutory and common law claims is six years. However, in cases of concealed fraud, the limitation period will only run from the time the fraud is discovered. For equitable claims, the position is more complex. There is no limitation period, but equity may apply a limitation period by analogy with an equivalent statutory claim. For example, directors owe both statutory and equitable duties to corporations. A six-year limitation period applies to a claim for breach of the statutory duty, and a time bar may be applied to an analogous claim for breach of the equitable duty. In the case of fraud, there is an obvious risk of assets that would otherwise be available to meet a judgment being moved or dissipated. A party may apply to the court for a freezing order to preserve assets in aid of a contemplated proceeding to prevent abuse of the court's process. give an undertaking as to damages. Orders can also be sought against third parties who hold or control assets beneficially owned by a respondent (e.g., banks). If an ex parte freezing order is made by the court, it operates only until the first inter partes return date. On that occasion, the applicant bears the onus of establishing why the order should continue, and the respondent will have the opportunity to argue as to why the order should be discharged. In addition to a freezing order, the court has the power to make ancillary orders for the purpose of obtaining information about the frozen assets, or as to whether an order should be made at all. The most common type of order made is that the respondent disclose, by way of affidavit, the nature, value and location of its assets. A party seeking to preserve evidence for use in a proceeding may apply to the court to obtain a search order. sufficient evidence that the respondent possesses important evidentiary material and that there is a 'real possibility' that the respondent might destroy that material or cause it to be unavailable for use in a subsequent court proceeding. The requirement for showing a 'real possibility' of destruction of evidence will typically require evidence of fraud or dishonesty on the part of the respondent. a separate application must be brought for access to the seized materials. The Australian courts have jurisdiction to make orders restraining a defendant from leaving the jurisdiction and requiring the delivery up of any passports. Before commencement of proceedings, evidence can also be obtained by an application for pre-action discovery from the proposed defendant. Third parties who were somehow involved in and facilitated the wrongdoing (even innocently) can be ordered to give limited discovery for the purposes of identifying the proper defendants to a proposed action (a Norwich Pharmacal order). Where a proceeding is on foot, material can be obtained from third parties by issuing subpoenas requiring the third party to produce relevant documents to the court. The insolvency of either the fraudster or the defrauded person can lead to additional avenues for the recovery of money or obtaining information in the wake of fraud. Where the defrauded entity becomes insolvent, extensive information-gathering powers are available to an external administrator of that entity. For example, a liquidator of an insolvent company can apply to court for leave to conduct a public examination. The court may require a person to attend court to give evidence and be cross-examined about the corporation's examinable affairs. Where a plaintiff is taking steps to seek to enforce an arbitral award in its favour and the defendant has assets in Australia, one of the options that the plaintiff might consider is applying to the Australian court for a freezing order in respect of those assets if there is a risk that they would otherwise be dissipated. A decision by the Federal Court of Australia in Coeclerici Asia (Pte) Ltd v. Gujarat NRE Coke Limited62 provides an example of the Court being willing to grant a freezing order over shares owned by that company prior to enforcement of the arbitral award. The applicable law for a claim arising out of fraudulent conduct or breach of fiduciary duty is the law of the place of the wrong, which is the place where the relevant conduct took place (subject to any mandatory statutes of the forum). If proceedings are brought in Australia in respect of such wrongs, this may mean there is no ability to serve process on an overseas defendant pursuant to the relevant court rules.68 It may also provide a basis on which an Australian court may decline to exercise its jurisdiction to hear the claim. Australia has acceded to the Hague Convention on the Taking of Evidence Abroad in Civil or Commercial Matters 1970. Each state and territory has passed legislation that gives power to the relevant Supreme Court to make orders for the collection of evidence upon receipt of a letter of request from a foreign court. The types of orders that a court can make include ordering the attendance of witnesses for examination; ordering the production of documents; and ordering the inspection, preservation, detention or custody of any property. Judgments obtained abroad for matters such as fraud or breach of fiduciary duty can be enforced in Australia in the same way as any other judgment. There are, however, various criteria that must be met before a foreign judgment can be enforced in Australia. The Foreign Judgments Act 1991 (Cth) provides a statutory scheme for the recognition and enforcement of judgments from various foreign countries with which Australia has made reciprocal arrangements.71 The Australian court will register the judgment at any time within six years of its date if the following requirements are met: the judgment must be final and conclusive; the judgment must be for a sum of money (punitive damages are not excluded from registration, although judgments for taxes, fines and penalties are excluded); and the judgment cannot be registered if it has been wholly satisfied or it could not be enforced in the country of the original court. the foreign judgment must be for a certain sum. Once a judgment against a corporation is entered or recognised in Australia, it is commonly enforced by issuing a statutory demand to the corporation. If the corporation fails to pay the debt or have the demand set aside, the judgment creditor is entitled to bring proceedings to have the corporation wound up in insolvency. Possible enforcement steps against individuals include petitioning for bankruptcy, serving an examination notice, obtaining a writ of execution, obtaining a garnishee order or obtain a charging order over property owned by the judgment debtor. it must be shown that the successful party was responsible for the fraud that taints the judgment under challenge. 1 Christopher Prestwich is a partner at Allens. This chapter was written with assistance from Jacques McElhone, an associate at Allens. 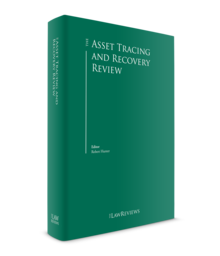 2 Justice Mark Leeming, 'Proprietary relief and tracing in equity' (2016) 90 ALJ 92 at 94. 3 Toksoz v. Westpac Banking Corporation (2012) 289 ALR 557. 4 Black v. S Freedman & Co (1910) 12 CLR 105. 6 See, for example, the Victims Rights and Support Act 2013 (NSW) and equivalent other state legislation. 7 Section 1317G of the Corporations Act 2001 (Cth). 8 Section 1317H of the Corporations Act 2001 (Cth). 9 See RP Balkin and JLR Davis, The Law of Torts (2013) at [23.12]–[23.42]. 10 See, for example, Perpetual Trustees Australia Ltd v. Heperu Pty Ltd  NSWCA 84. 11 Pioneer Mortgage Services Pty Ltd v. Columbus Capital Pty Ltd  FCAFC 78. 12 Westpac Banking Corporation v. Bell Group Ltd (in liq) (No. 3) (2012) 44 WAR 1, which was appealed to the High Court but settled prior to judgment. 13 Schedule 2 of the Competition and Consumer Act 2010 (Cth) (formerly known as the Trade Practices Act 1974 (Cth). 14 Section 236 of the Australian Consumer Law. 15 Australian Consumer Law definition of 'involved' (Section 2). 16 See Sections 79 and 1325 of the Corporations Act. 17 Yorke v. Lucas (1985) 158 CLR 661 at 667–668 (Mason ACJ, Wilson, Deane and Dawson JJ). However, in a different factual context, the precise 'essential matters' of which knowledge must be established may be open to dispute; Lifeplan Australia Friendly Society Ltd v. Ancient Order of Foresters in Victoria Friendly Society Ltd  FCAFC 74. 18 Giorganni v. R (1985) 156 CLR 473 at 507–508 (Wilson, Deane and Dawson JJ). 19 See, e.g., Krakowski v. Eurolynx Properties Ltd (1995) 183 CLR 563. 20 HIH Insurance Ltd (in liq) v. Adler  NSWSC 633 at . 21 Section 729 of the Corporations Act 2001 (Cth). 22 See Farah Constructions Pty Limited v. Say-Dee Pty Limited  HCA 22; (2007) 230 CLR 89 at –; Harstedt Pty Ltd v. Tomanek  VSCA 84 at . 23 See Selangor United Rubber Estates Ltd v. Craddock (No. 3)  1 WLR 1555 at 1590-1, referred to with approval by Gibbs J in Consul Developments Pty Ltd v. DPC Estates Pty Ltd (1975) 132 CLR 373 at 398. 24 The High Court held in Farah Constructions Pty Limited v. Say-Dee Pty Limited  HCA 22; (2007) 230 CLR 89 that the level of knowledge required is at least knowledge of circumstances that would indicate the facts to an honest and reasonable person (i.e., something short of actual knowledge or wilful blindness can be sufficient to found a knowing assistance claim in equity). 25 Nicholson Street Pty Ltd (Receivers & Managers Appointed) (In Liquidation) v. Letten  VSC 583 at  (Judd J) (reversed by the Court of Appeal on other grounds). 26 Casio Computer Co Ltd v. Sayo (No. 3)  EWCA Civ 661; Grupo Torras SA v. Al-Sabah [No. 5]  CLC 1469 at 1667 (Mance J). See further Alison Gurr, 'Accessory Liability and Contribution, Release and Apportionment' (2010) 34(2), Melbourne University Law Review 481. 27 Giorgianni v. R (1985) 156 CLR 473 at 482–483, 486–8 (Gibbs CJ), at 494–495 (Mason J), at 500, 505–506 (Wilson, Deane, Dawson JJ); 58 ALR 641; 59 ALJR 461. 28 The precise terms used for the conduct of the accessory varies among different states and territories. 29 In re Diplock; Diplock v. Wintle  Ch 465 at 520;  2 All ER 318; Agip (Africa) Ltd v. Jackson  Ch 547 at 566. 30 (1910) 12 CLR 105 at 110 (O'Connor J). 31 Foskett v. McKeown  1 AC 102 at 127; In re Diplock; Diplock v. Wintle  Ch 465 at 544;  2 All ER 318. 32 See, for example, Sections 42 and 118 of the Real Property Act 1900 (NSW). See further Cassegrain v. Gerard Cassegrain & Co Pty Ltd (2015) 254 CLR 425;  HCA 2. 33 Re Oatway; Hertslet v. Oatway  2 Ch 356; (1903) 88 LT 622. 34 In re Diplock; Diplock v. Wintle  Ch 465 at 539, 541;  2 All ER 318. 35 See Sze Tu v. Lowe  NSWCA 462. 36 In re Diplock; Diplock v. Wintle  Ch 465 at 546–8;  2 All ER 318. 37 Russell Gould Pty Ltd v. Ramangkura (2014) 87 NSWLR 552. 38 Alesco Corporation Limited ACN 008 666 064 v. Te Maari  NSWSC 469 at . See also Federal Republic of Brazil v. Durant International Corporation  3 WLR 599;  UKPC 35;  All ER (D) 21 (Aug). 39 J C Campbell, 'Republic of Brazil v. Durant and the equities justifying tracing' (2016) 42, Australian Bar Review at 32. 40 Alesco Corporation Limited ACN 008 666 064 v. Te Maari  NSWSC 469 at . 41 (1874) LR 9 Ch App 244; Consul Development Pty Ltd v. DPC Estates Pty Ltd (1975) 132 CLR 373; Farah Constructions Pty Ltd v. Say-Dee Pty Ltd (2007) 230 CLR 89. 42 Grimaldi v. Chameleon Mining NL (No. 2); Chameleon Mining NL v. Murchison Metals Ltd (2012) 200 FCR 296; (2012) 287 ALR 22. 43 Westpac Banking Corporation v. Bell Group Ltd (in liq) (No. 3) (2012) 270 FLR 1; (2012) 89 ACSR 1 at – (Drummond AJA, Lee AJA agreeing); Consul Development Pty Ltd v. DPC Estates Pty Ltd (1975) 132 CLR 373 at 396–7; 5 ALR 231; Farah Constructions Pty Ltd v. Say-Dee Pty Ltd (2007) 230 CLR 89; (2007) 236 ALR 209 at 245; Grimaldi v. Chameleon Mining NL (No. 2); Chameleon Mining NL v. Murchison Metals Ltd (2012) 200 FCR 296; (2012) 287 ALR 22; Evans v. European Bank Ltd (2004) 61 NSWLR 75 at 107. 44 Evans v. European Bank (2004) 61 NSWLR 75 at 106–107. 45 Baden v. Société Générale pour Favoriser le Développement du Commerce et de l'Industrie en France SA  1 WLR 509. 46 Westpac Banking Corporation v. Bell Group Ltd (in liq) (No. 3) (2012) 270 FLR 1; (2012) 89 ACSR 1 at – (Drummond AJA, Lee AJA agreeing); Grimaldi v. Chameleon Mining NL (No. 2); Chameleon Mining NL v. Murchison Metals Ltd (2012) 200 FCR 296; (2012) 287 ALR 22 at –; Equiticorp Finance Ltd (in liq) v. Bank of New Zealand (1993) 32 NSWLR 50 at 103; Re Three Chimneys Pty Ltd (in liq)  NSWSC 1754. 47 Crimes Act 1900 (NSW) Section 188; Criminal Code (NT) Section 229(1); Criminal Code (Qld) Section 433; Criminal Code (WA) Section 414; Criminal Code (Tas) Section 258; Criminal Code 2002 (ACT) Section 313; Crimes Act 1958 (Vic) Section 88(1); and Criminal Law Consolidation Act 1935 (SA) Section 134(5), 134(6). 48 Frigo v. Culhaci  NSWCA 88. 49 Downer EDI Engineering v. Taralga Wind Farm Nominees No. 2  NSWSC 971. 50 See Section 25 of the Australian Securities and Investments Commission Act 2001 (Cth). 51 See Section 76 of the Australian Securities and Investments Commission Act 2001 (Cth). 52 See also Section 32(1) of the Cheques Act 1986 (Cth): a forged drawer's signature is wholly inoperative unless there is an estoppel against the person whose signature it purports to be, or the person has ratified or adopted the signature. 53 Marion Hetherington, 'Responsibility for Payment of Forged Cheques: Lessons from NAB v. Hokit' (1996) 7 JBFLP 313. See also Tony Damian, 'The Customer is Nearly Always Right: Banks and Unauthorised Cheque Payments' (1996) 7 JBFLP 277. 54 See Varker v. Commercial Banking Co of Sydney Ltd  2 NSWLR 967; Ryan v. Bank of New South Wales  VR 555; National Australia Bank Ltd v. Meeke  WASC 11. 55 Alan Tyree, Banking Law in Australia (2017) at 2226–7; Lipkin Gorman v. Karpanale Ltd  2 AC 548. 56 See Sections 32, 36, 41, 43 and 81–84. The federal government has indicated it is working on extending the reforms to lawyers, accountants, trust and company service providers, real estate agents and jewellers. 57 See Anti-Money Laundering and Counter-Terrorism Financing Rules Instrument 2007 (Cth), Chapter 4. 58 See Port of Brisbane v. ANZ Securities Ltd (No. 2)  2 Qd R 661;  QCA 158. 59 Dr Vicky Priskich, 'Liability of a payee on a cheque for conversion and moneys had and received – Heperu Pty Ltd v. Perpetual Trustees Australia Ltd ' (2011) 34 Australian Bar Review 214 at 227–230. 60 Section 120 of the Bankruptcy Act 1966 (Cth). 61 Section 8(7A)(a) of the International Arbitration Act 1974 (Cth). 63 Briginshaw v. Briginshaw (1938) 60 CLR 336. Certain state legislation now prescribes the standard of proof in civil proceedings: See, for example, Section 140, Evidence Act 2008 (Vic). 64 (1996–7) 188 CLR 501 at 556, per McHugh J. 65 Baker v. Campbell (1983) 153 CLR 52. 66 AWB Limited v. Honourable Terence Roderic Hudson Cole (No. 5)  FCA 1234. 67 Attorney-General (NT) v. Kearney (1985) 158 CLR 500. 68 See Traxon Industries Pty Ltd v. Emerson Electric Co (2006) 230 ALR 297 at . 69 Voth v. Manildra Flour Mills Pty Ltd (1990) 171 CLR 538. 70 PT Bayan Resources TBK v. BBC Singapore Pte Ltd (2015) 325 ALR 168;  HCA 36. 71 As specified in the Foreign Judgments Regulations 1992 (Cth). 72 See Wentworth v. Rogers (No. 5) (1986) 6 NSWLR 534. 73 Rejfek v. McElroy (1965) 112 CLR 517. 74 Benefit Strategies Group Inc v. Prider (2005) 91 SASR 544 at . 75 See M Davies, AS Bell and PLG Brereton, Nygh's Conflict of Laws in Australia (2013) at [40.65].